The editorials and airwaves are filled with warnings that the new Medicare drug benefit is overwhelmingly confusing – certainly discouraging words for seniors who both want and need this new benefit. Our advice: Don’t give up. The Medicare website, www.medicare.gov, has been inundated with visitors (more than a million on Sunday alone), and the site is clearly a work in progress. The 1-800-MEDICARE phone lines also are swamped with seniors anxious to learn more and sign up. Medicare Administrator Mark McClellan and his team are working feverishly to fix problems and expand capacity, but seniors have until May to sign up. So there’s time. And about the confusion: The trade off for having choices of drug benefits is?having to make choices. It could have been simple: The government could have told seniors what they would pay and which drugs they would get – maybe your drugs would be on the drug list and maybe not. But as it is, they do have choices, with more plans participating in the benefit than anyone expected. Kudos to CMS for this! And, miracle of miracles, seniors actually know their options and what’s covered by the different plans. That’s not what people are used to in our paternalistic health insurance market. Welcome to the future. Seniors will have to narrow down their decisions to pick the plan that provides them the best deal, the lowest premium, and the greatest selection where they live. But with an average of 42 plans per region, it takes some work. The site does requires web savviness to navigate, so when you are home visiting parents or grandparents over Thanksgiving (or Christmas), it would be a great time to sit down with them at a laptop to help decide whether and which plan to choose. Zero premiums: Seniors in 44 states can pick a Medicare Advantage plan with no additional drug premium (instead of the $35 monthly fee estimated by Congress), and there is at least one plan with a $20 premium almost everywhere. Humana gets the prize for the lowest-priced drug plan, coming in at $1.87 a month in Iowa. No deductibles: 58% of plans will have no deductible (instead of the $250 in the standard plan designed by Congress). Filling the doughnut hole: One fourth of the Medicare Advantage plans and one sixth of all drug plans offer coverage in the dreaded doughnut hole (the standard plan doesn’t cover drug spending between $2,250 and $5,100). How can anyone argue that private sector competition hasn’t come up with better options than the benefit plan Congress designed? How have the plans been able to do this? Tough negotiations over drug prices, for starters. Some major drug companies are very upset because they have been shut out of formularies for the drug plans that wouldn’t or couldn’t offer low enough prices. And the Medicare Advantage plans look more and more attractive all the time, offering integrated coverage at low prices. So to our friends who are still criticizing MMA: Isn’t this what we were trying to accomplish all along? Having seniors pick from among competing private health plans that offer a full range of health services, including drugs? And having this supported by a defined contribution payment that follows the senior? Yes. And that’s the direction that this legislation is taking us! Health Policy Matters will return after Thanksgiving. Have a wonderful holiday, celebrating our good fortune to live in a country that offers so much opportunity and freedom – and choice. The party of Sam’s Club: Isn’t it time the Republicans did something for their voters? The Senate’s recent vote to create “values-based purchasing” or “pay for performance” rules for physicians “would establish, in effect, government guidelines for the practice of medicine and tie Medicare payment to physician compliance with those guidelines,” writes Richard Dolinar, an Arizona physician and scholar with the Heartland Institute. “The irony of the recent Senate action is that with all of the rhetoric on the importance of ‘evidence-based medicine,’ the Congress is posed to implement a Medicare ‘pay for performance’ system that is, in fact, short on evidence and pregnant with perverse incentives,” writes Dolinar. Congress should instead “reform the flawed physician payment system, which is driven by outdated administrative formulas, and introduce changes that reflect the real market conditions of supply and demand for medical services,” concludes Dolinar. Health Savings Accounts and Tax Subsidies: How Effective Can They Be? Friday, November 18, 2005, 2:00-4:00 p.m.
For additional details and registration information, go to: www.aei.org/events. For additional details and registration information, go to: www.cato.org. 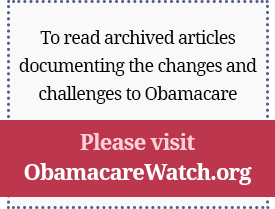 Health Policy Matters is a weekly newsletter containing summaries of timely and informative studies and articles on free-market health reform. It features research and writings by participants in the Health Policy Consensus Group, articles of interest from the health policy world, and announcements of coming events. Health Policy Matters is published by the Galen Institute, a not-for-profit public policy organization specializing in information and education on health policy. For more information about the newsletter and our organization, please visit our website at http://www.galen.org/. If you wish to subscribe to this free weekly newsletter, update your address, or be removed from our list, please send an e-mail message to galen@galen.org. The views expressed in this newsletter are the opinions of the authors and do not necessarily reflect the views of the Galen Institute or its directors. Next Article: Confusing Choices in Medicare?